Ink spatulas (French: spatule) are a type of spatula used in the printing of woodblocks and other print art when blending colors and adjusting the thickness of the ink, spreading ink on the inking surface, and in cleaning. Spatulas come in a variety of shapes and are made of various materials, depending on how they will be employed. In terms of materials, the two primary types are those made from resins and those made of metal (such as stainless steel.) Those made of resin are inexpensive and easy to take care of, since there is no need to worry about rust. In some cases, however, the solvents used in the cleaning process may cause them to deteriorate. Those made of metals such as stainless steel must be maintained, but deterioration will be minimal and they will maintain their rigidity longer. Finally, they grow easier to use with experience. In terms of shape, they are often shaped like a plectrum but can come in other shapes depending on their function. In the case of screen prints, in which the spatula will come in direct contact with the thin screen that acts as the printing surface, the corners are rounded so as to avoid damaging the screen. In the case of lithographs, a wide spatula is used to spread the ink thinly and evenly on the inking surface. In the case of copperplates, in which thick copperplate ink must be pressed into the grooves on the surface, a somewhat more narrow and rigid spatula is used. 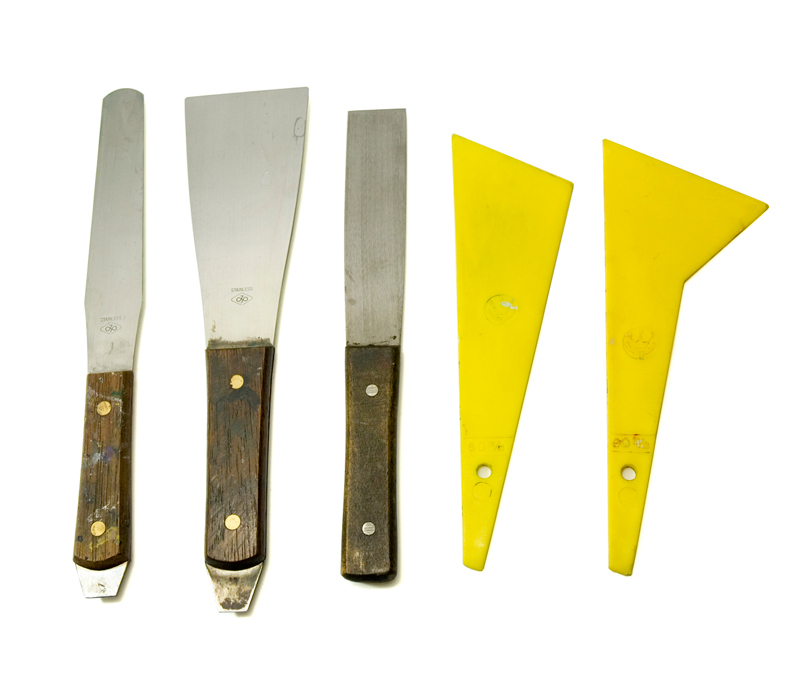 These are only some of the examples of the different types of spatulas that are used in different circumstances. One should exercise caution not to blend in undesired colors when combining multiple inks. To this end, it is preferable to use one spatula for each color. Also, because new spatulas and thick metal spatulas can easily damage inking surfaces, prior to the first use one should round their corners in advance by rubbing them on a whetstone or on sandpaper, using the same motions as when applying ink. Spatulas may be purchased at art supply stores and hardware stores.